SO, YOU'VE GOT A CUTE #DAFFODILBOMB AT HOME BRIGHTENING UP YOUR KITCHEN OR POKING OUT OF YOUR CUBICLE. DON'T FRET WHEN THE LEAVES START TO BROWN AND THE FLOWERS FADE! LET THE LEAVES WILT AND THE DIRT DRY OUT AROUND THE BULB. THOSE LEAVES ARE SOAKING UP AS MUCH SUN AND NUTRIENTS AS POSSIBLE BEFORE THE DAFFODIL GOES DORMANT. SO RESIST THE URGE TO TRIM THEM BACK SO SOON. ONCE FULLY BROWN, YOU CAN SNIP OFF THE LEAVES ABOUT AN INCH FROM THE TOP OF THE BULB AND SHAKE OFF THE EXCESS DIRT. STASH THAT BULB IN A COOL, DRY, DARK PLACE (LIKE BROWN PAPER BAG ON A SHELF IN THE GARAGE) AND WAIT TILL AUTUMN ROLLS AROUND. NEXT OCTOBER, A FEW WEEKS BEFORE THE FROST, DIG A FEW INCHES DOWN IN YOUR GARDEN, DROP IN THE DAFFODIL BULB (LEAF-END POINTING UP) AND COVER IT WITH SOIL. FINAL STEP, WAIT PATIENTLY FOR SPRING! 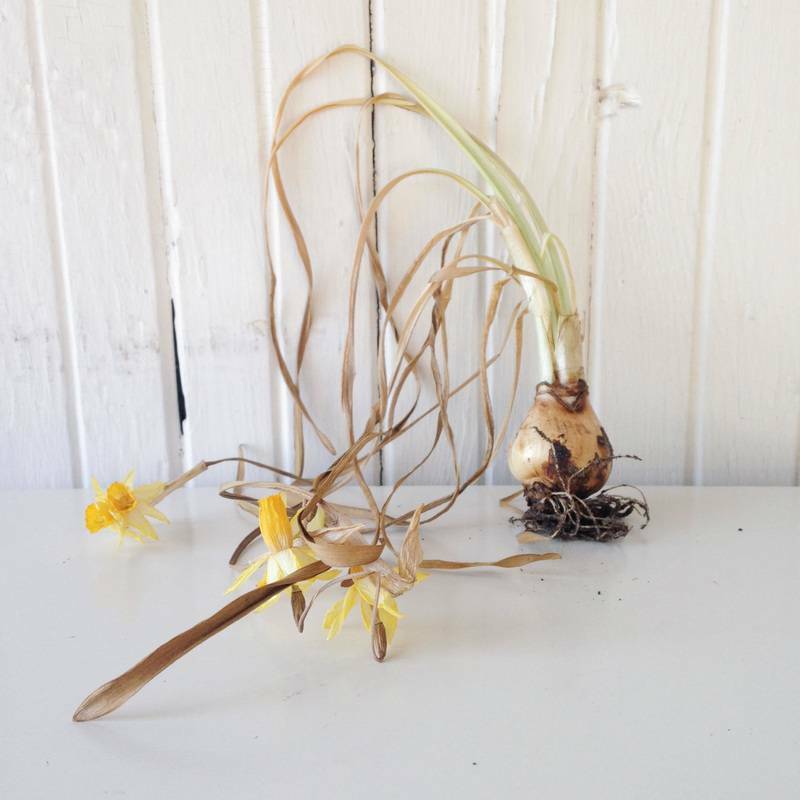 BULBS HAVE A PRETTY INCREDIBLE LIFE CYCLE. THEY'RE DORMANT, UNDER THE SOIL FOR MOST OF THE YEAR, BUT THEY SURE ARE A WELCOME ADDITION TO SPRING EACH YEAR!